An IMAGIC WEAVE® transparent media façade leads the way at The Skolkovo Innovation City. Designed by the architect Boris Bernaskoni, HYPERCUBE is the first high-tech building of The Skolkovo Innovation City. 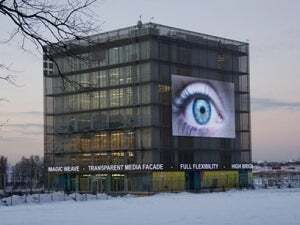 Equipped with 415m² IMAGIC WEAVE transparent media façade, HYPERCUBE can be transformed into a multifunctional information screen. "Just like the International Space Station, HYPERCUBE is a physical area of innovation and experimentation in architecture, engineering, art and media," said Bernaskoni. Bernaskoni planned HYPERCUBE to be the centrepiece of Skolkovo Innovation City. Made from glass, concrete and metal, he also chose a functional and aesthetically attractive façade made of 3,200m² stainless-steel wire mesh, incorporating 415m² IMAGIC WEAVE transparent media façade. The architectural wire mesh, made from high-quality stainless steel, was customised to meet the architect’s specific design criteria. A new type of mesh called EGLA-MONO 4961 was created to meet the special requirements. The stainless-steel wire mesh façade offers many advantages, including easy maintenance, recyclability and clear views out of the building. In addition, the EGLA-MONO 4961 has an open area of 73%, which allows natural daylight to flood through the tall windows into the building so additional light sources are not needed during the day. IMAGIC WEAVE transparent media façade acts as the mouthpiece of the building and adapts flexibly to different user requirements. Groups of visitors could be welcomed by the façade, which can feature items such as news, videos or presentations. The media façade is divided into two areas: one main screen and a scrolling text area. The 23 pixels high scrolling text area is located at the bottom of the mesh façade and runs seamlessly in a horizontal line around all four sides of the façade. 322 x 186 pixels with 234m² form the main screen on the north façade. The media façade system had to meet some very special requirements. It had to be ensured at the start of the project that the entire system was designed to cope with extremely cold temperatures. To handle this, an additional management system was installed to shut down the entire system should outside temperatures fall to -30°C to protect the whole media façade. Fire exits had to be integrated into areas of the wire mesh façade to comply with building regulations. Customised frames were specially developed to form operable doors, which were also integrated into the façade system. The technical controls of the media façade are located inside the building in four control rooms. Even though the controls are quite complex, the operation of the media façade is very easy and can be done from the control room, wireless via a smartphone or tablet PC, or with remote maintenance from anywhere in the world. As well as the media façade, there is as an additional design element, a 260m² Japanese artwork on the south façade. Haver & Boecker painted the design across the 11 wire mesh elements. As a system supplier of IMAGIC WEAVE transparent media façade, Haver & Boecker offers a comprehensive package from a single source; from consulting and planning, the manufacture of the wire mesh, provision of installation instruction through to the commissioning of the media façade, including software and hardware training.